With eSATA cables from Cables To Go you can now utilize shielded cable lengths up to 2 meters outside the PC to take advantage of the benefits the SATA interface brings to storage. 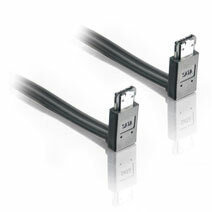 SATA is now out of the box as an external standard, with specifically defined cables, connectors, and signal requirements. eSATA provides more performance than existing solutions and is hot pluggable. This page was generated on Thursday the 25th of April 2019 at 8:49:30 PM EST.